Global settings can be changed in the settings window. Check updates available online to see if a new version of APAS/Wizard or any of its templates are available. 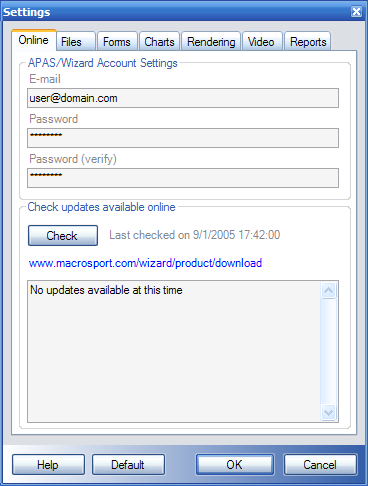 Elements can generally be removed from a tree, such as in the database window, or in the wizard window. This setting determines whether or not a question is shown asking you to confirm. This setting determines whether or not a question is shown asking you to confirm to exit the application. This setting determines whether or not information is written to a log-file. This log-file can be used to trouble-shoot why something is not working as it should. Name of the log file as specified above. This setting determines whether the application will open a window with the same size and in the same location as last time you closed it. Determines where to find the documentation, Local, Online, or Automatic. In automatic mode the application determines if there is an internet connection and prefer the online documentation instead of the local documentation. Number of cameras available on your system. Allow user to change the number of cameras needed when capturing new videos. Ordinarily this would already be specified in the templates. On certain occasions APAS/Wizard will launch other APAS modules and communicate with them. Ordinarily there should be no reason to preview communication. This determines the contents of a report. See here for more information. This determines the layout/format of a report. See here for more information. This determines the style of a report. See here for more information. When generating a report, an intermediate XML report can be saved. Ordinarily there should be no reason to examine the intermediate results. Select Default XML (probably Internet Explorer), or the built-in Template Editor. Select Default HTML (probably Internet Explorer), or the built-in Report Viewer. Generated on 4/22/2019 5:07:55 PM (PST) ADI/HQ/GBA/2019/ARIELCLOUD/v3.0.2018.0126.